Can I use GoPro Mini Video Camera For Historical Documentary? Question: The GoPro is supposedly designed for extreme sports action ... the project I am working on is a documentary style film which will require shots of historic still photos of the historic people highlighted and interviews with live persons, the interviews will be indoor and outdoor shots. There will be limited live action and the project will require narration. Outside/outdoor film shots will be historic buildings and landscapes. Given the promoted capabilities and purpose of the GoPro, extreme actions, the question came to mind because of the need for and type of shots I will need to make....... not extreme action as you can see. I will be creating DVD's for educational purposes. I was taken by the quality and resolutions (in the demos) the camera displayed. Desktop Documentaries: You are right, the GoPro HD is a pretty awesome little camera that is excellent for capturing extreme and sports shots. Of course, the camera can be used for any purpose that your creative mind can come up with, not just for extreme filming. For example, if you wanted to capture the inside of a small room, the GoPro works great to get a wide angle shot.. or perhaps you could use it to walk through a building to give an interesting fisheye perspective. With documentary filming, the subject matter (and budget) dictates what equipment you use. There are no cookie-cutter rules. You as the director need to decide the look and feel of your film and then decide what equipment and style of filmmaking will work best within the parameters of your budget. Traditionally speaking, maybe a mini-video camera is not used in historical documentaries, but that doesn't mean it wouldn't be perfect for YOUR film. Maybe you have some really good reason by a GoPro would be perfect for a shot you're trying to get or an idea/feeling you're trying to capture. Remember, "form follows function". Don't just use a GoPro to use a GoPro. Make sure there's a REASON behind it. Learn the basics of How To Make A Documentary. Anyone else have ideas about this topic? Please comment below. Comments for Can I use GoPro Mini Video Camera For Historical Documentary? Actually, if you shoot in the narrow mode and mostly steady shots, either from atop a tripod or a simple steadycam, the product will be as superior as any other high end and expensive production! I am on the same page as you are. having the same thought !! Gopro or not?? I spent the last couple hours reading on gopro. I also want to make historic, field exploration /research based films. In addition to using a hand held video camera, I want to mount a small camera in multiple spots in a 4wd, and with a laptop, manage the cameras and store the footage. Then I would / should?? .. be able to continuously film and while driving across the vast miles of the high desert of Idaho, Nev., etc. and then edit from a large amount of footage amassed. The gopro would be great, if not for the fish eye look (im not a fan of that much... LOL ) that they all seem to have from what I have seen in vids. I dont think there is any way to change the ultrawide field of view. I am going to continue to try and find other "affordable" options that will have more capabilities ie. zoom, manual focus, etc... ,and will produce a more desirable quality. The hero 3/3+ Black editions can shoot at 2.7k 24/30fps and in medium field of view for a more flat non-fisheye look. Also they are capable of shooting in protune with flat color for post color correcting to match any other camera you have. The lens can also be changed from the factory lens at 2-3mm to a 5mm lens for little money. That can make you image less fisheye while not changing the FOV. The FOV is a digital crop but not the same as shooting wide then cropping in post. The camera will shoot the next hi seat resolution then crop in on that for the FOV change. So don't shoot wide thinking you can crop out the center in post for the same effect. If that is what you plan you will need to shoot the next size up so for 1080 output shoot 2.7k wide and crop the center for 1080 medium. Doing this allows for moving the image in the new crop for better composing in post. I am using a couple of gopro with my Sony DSLR a77 for b roll and the shot of the interviewer and capturing the whole production with the fisheye for "how it was made" footage. Use off camera recording device. iPhone, digital voice recorder with lapel mic, or lapel mic to camera. I use all three incase one fails or doesn't pickup everything. Once I start to get payed I will buy the h1 zoom and get some sweet sound. 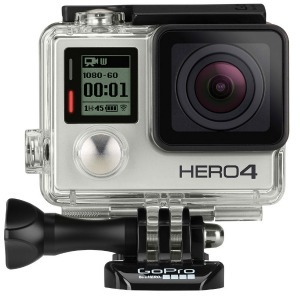 The new GoPro HERO4 is out! Amaaaaazing quality. In fact as a graphic designer turned semi pro documentary film maker, I have successfully combined Gopro footage with that of a6000 and a77 . Essentially I have used Gopro mounted on a g3ultra gimbal and used it for walk throughs and ride throughs. With an effective 'fish eye reduction' plugin in fcpX and a bit of color grading, it works brilliantly, while adding a lot if interest and ease of camera handling. Purists may not like the experiment but most audience will love it.